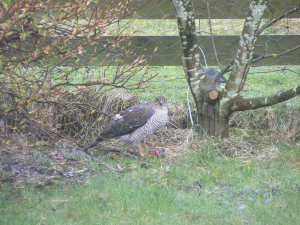 This bird was seen in our "garden", if you can call it that. It's really part of a field in Shetland on which we have planted trees and bushes for protection from the elements. When it left we found the remains (two feet, one leg and feathers) of a blackbird which had been resident in the garden over the winter.